Bibliographic Information: Demirgian, Andreea & Bucur, Oana. 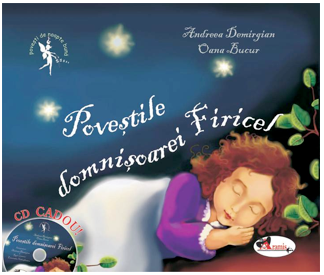 Povestile domnisoarei Firicel [Miss Firicel’s Stories].Bucurest: Aramis Print s.r.l., Bucuresti, 2009. Miss Firicel is a curious little girl, as are all children. Her mother tries to answer the questions that bother her. The 7 stories in the book, one for each night, are related to the child’ s world. Discovery, nature and healthy habits are some of the themes found in the stories. Bedtime stories are not just a myth of past ages when TV and the computer had not been invented, they are a necessity for each and every child’s development and education. Miss Firicel’s Stories are challenging for parents interested in educating their children asthey answer questions that the little curious girl is posing. They are interesting and stimulating for an audience of varied age groups. Furthermore, several words in the text are common to more than one languages.